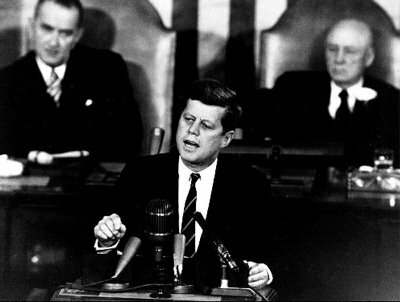 January 11: President-elect Kennedy released a special report made to him by an ad hoc committee of 9 members, with Dr. Jerome B. Wiesner of M.I.T. as chairman. The report called for a sweeping reorganization of the national space program to increase its effectiveness. The report was critical of past leadership and direction, and viewed both national security and prestige as being at stake. It called for effective use of the Space Council, single direction within the Department of Defense of military space efforts, stronger technical management in NASA, and closer partnership with industry. 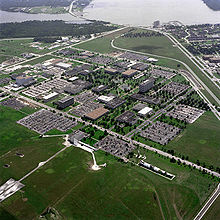 January 13: The National Aeronautics and Space Administration announced that on February 1, it would activate a new life sciences research laboratory at the Ames Research Center in Sunnyvale, Calif.
January 31: Ham, a chimpanzee, was launched on a 16.5 minute suborbital space flight in Mercury-Redstone 2. 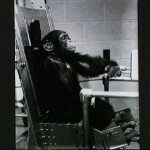 Ham had been trained to pull levers to receive rewards of banana pellets and avoid electric shocks to evaluate his performance. 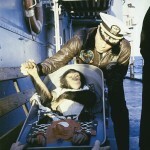 Ham had his vital signs and tasks monitored by telemetry and were nominal on post-flight analysis. The rocket had a steeper than planned- angle which caused an abnormal increase in the planned acceleration to 17 G. There was an early abort due to a loss of cabin pressure which caused firing of the launch escape system. This problem occurred at 2 minutes and 18 seconds into the flight, when cabin pressure dropped from 5.5 to 1 psi. This malfunction was traced later to the air inlet snorkel valve. Ham was safe in his own couch spacesuit and did not suffer any ill effects from the loss of cabin pressure. His performance in space was only a fraction of a second slower than on Earth, pushing levers about 50 times during the flight and demonstrating that tasks could be performed in space. The steep flight angle and launch abort added up to an overshoot of the planned landing area by 130 miles (209 km) and an apogee of 253 km (157 miles) instead of 185 km (115 miles). Ham was weightless for 6.6 minutes instead of the 4.9 minutes that were planned. Ham was kept at the National Zoo for the rest of his life and died of old age in 1983. January 31: Launch of Samos 2 (reconaissance satellite) from Vandenburg AFB on a Atlas-Agena A.
preparation for manned space flight. A series of lectures was presented to the astronauts by the Operations Division of the Space Task Group in this respect. 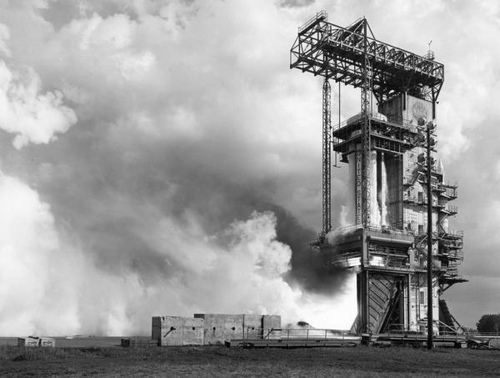 February 1: First static test firing of the Saturn 1 S-1 stage at Marshall Space Flight Center with eight H-1 engines. 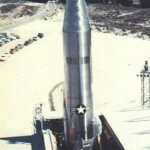 February 1: Minuteman, the new Air Force ICBM, was launched for the first time at Cape Canaveral in a major test, and the results were very good. All three stages were fired, and the solid-fueled ICBM traveled 4600 miles, carrying a full guidance system that brought the nose cone right to the target area. Some 400 pounds of instruments were carried. 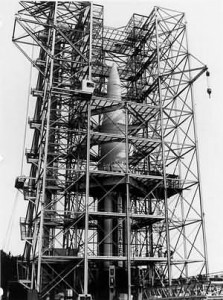 The press reported Minuteman to be made up of a Thiokol solid-fueled rocket of 170,000 pounds thrust, 24 feet long and 5.5 feet in diameter; an Aerojet solid-fueled rocket second stage of 55,000 pounds thrust; a Hercules solid-fueled rocket third stage of 35,000 pounds thrust. 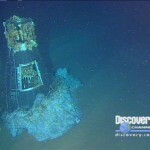 The total missile is said to weigh 66,000 pounds, and to be 58 feet long. February 4: Launch of Sputnik 7 (Venera – 1VA #1, planned Venus flyby which failed to leave Earth orbit). First attempt to launch a probe to Venus. February 10: The Rocketdyne F-1 liquid-fueled rocket engine was tested for a few seconds at Edwards Air Force Base, Calif., at a power 1,550,000 pounds of thrust. Combustion instability would continue to be a problem until late 1961. 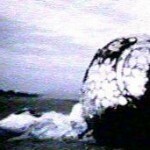 February 12: The USSR launched a probe to Venus (flyby) – Venera 1 (also called 1VA-#2). 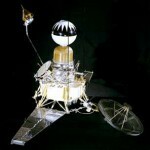 Communications were lost enroute to Venus which it passed on May 19, 1961 at 100,000 km and entered a heliocentric orbit. Also sometimes called Sputnik 8. 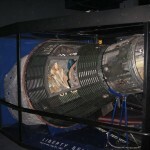 The 11D33 engine was the world’s first staged-combustion-cycle rocket engine, and also the first use of a ullage engine to allow a liquid-fuel rocket to start under weightlessness (first launch from orbit). 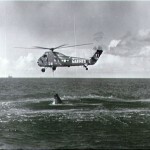 During most of its flight, it was spin stabilized. 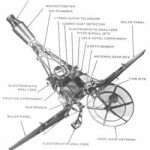 It was the first spacecraft designed to perform mid-course corrections, by entering a mode of 3-axis stabilization, fixing on the Sun and the star Canopus. February 13: NASA and McDonnell began discussions of an advanced Mercury spacecraft. 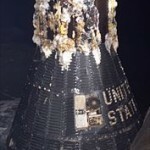 McDonnell had been studying the concept of a maneuverable Mercury spacecraft since 1959. 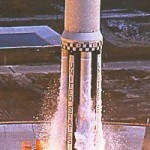 February 16: Launch of Explorer IX from Wallops Island (Scout launch vehicle). February 17: Discoverer 20 launch from Vandenburg AFB by a Thor Agena B.
February 18: Discoverer 21 launch from Vandenburg AFB by a Thor Agena B. 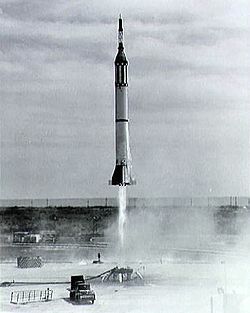 First successful restart of the Agena B.
February 21: Successful suborbital unmanned flight of Mercury Atlas-2. Launched from LC14, 17 minutes duration, altitude of 114 miles and a range of 1,431.6 statute miles. This was a test to check maximum heating and its effects during the worst reentry design conditions. February 21: Astronauts John Glenn, Virgil Grissom, and Alan Shepard were selected by the Space Task Group to begin special training for the first manned Mercury flight. February 22: France launched a rat on the Veronique sounding rocket. 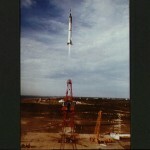 February 22: Successful launch of Thor Able/Transit 3B from LC17B. February 25: Failed launch attempt of Juno II/Explorer (S-45) from LC26B. March 8: Report from the House Committee on Science and Astronautics was released, “A Chronology of Missile and Astronautic Events”. 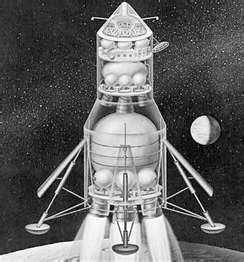 March 9: Sputnik 9 (also called Korabl Sputnik 4 or Vostok 3, No.1). Successful re-entry with dog, Chermuchka. 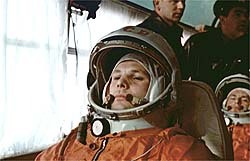 March 23: Cosmonaut Valentin Bondarenko was in training in a special low-pressure chamber at the Moscow Institute of Biomedical Problems with a 100% oxygen atmosphere. He threw an alcohol-soaked cloth onto an electric hotplate. In the pure oxygen environment, the fire quickly engulfed the entire chamber. 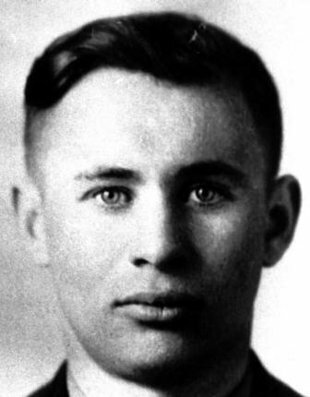 Bondarenko suffered third-degree burns over most of his body and was barely alive when the chamber was opened, and died of his burns shortly after being hospitalized. 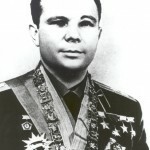 Bondarenko’s death was covered up by the Soviet government; word of his death only reached the West in 1986. 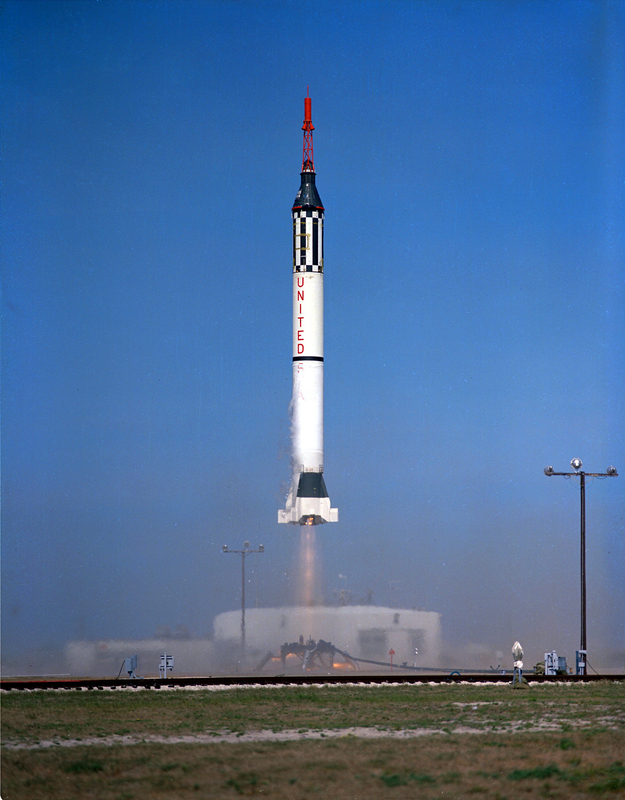 March 24: Launch of Mercury Redstone BD (suborbital booster developmental flight). 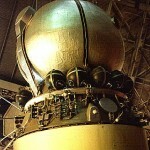 March 25: Sputnik 10 (also called Korabl Sputnik 5 or Vostok 3, No.2). Successful re-entry with the dog, Zvezdochka. March 25: Successful Explorer X launch by a Thor Delta from LC17A. 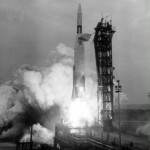 March 30: Failed launch of Discoverer 16 from Vandenburg AFB on a Thor-Agena B.
April 8: Discoverer 23 launch from Vandenburg AFB by a Thor Agena B. Aviation Medical Acceleration Laboratory centrifuge in preparation for the first manned Mercury-Redstone suborbital flight. 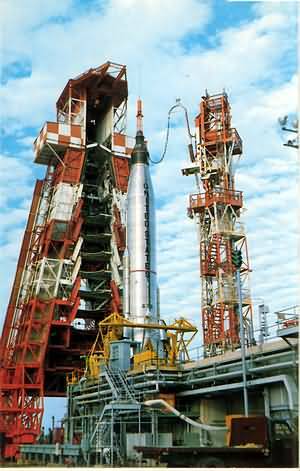 April 12: Launch of Vostok 1 on a modified R-7 booster from Baikonur with Yuri Gagarin. 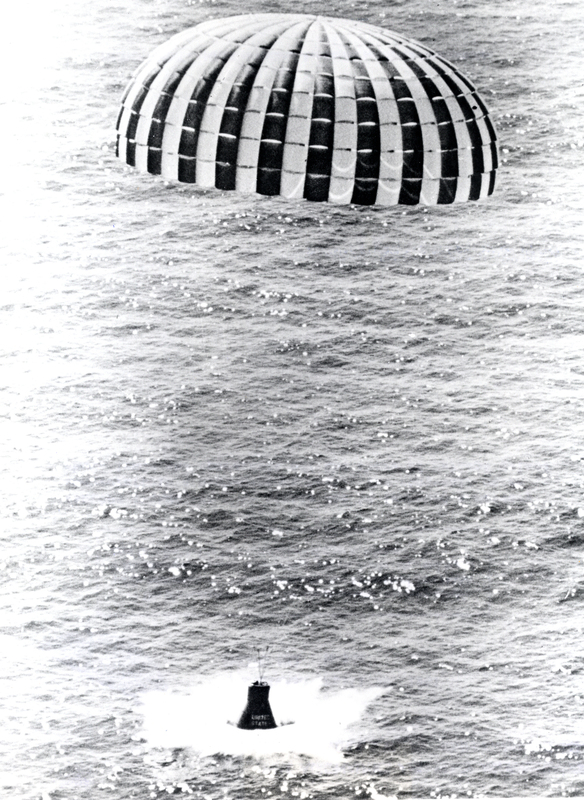 The one orbit, 108-minute flight terminated in a planned parachute ejection from the capsule. 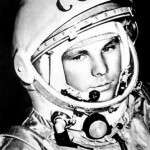 He was the first man in space. April 25: Space Medicine Branch meeting in Chicago. Dr. John M. Talbot was elected President. 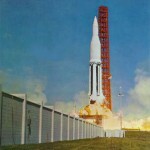 April 25: Launch of Mercury Atlas-3 from LC14. The unmanned vehicle was destroyed by range safety at 43 secs due to a problem with the pitch and roll programs. 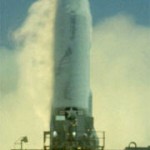 The abort-sensing system activated the escape rockets prior to the launch vehicle’s destruction at an altitude of 16,400 feet. The spacecraft then coasted up to 24,000 feet, deployed its parachutes, and landed in the Atlantic Ocean 2,000 yards north of the launch pad. 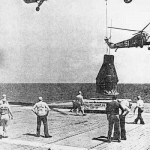 The spacecraft was recovered and was found to have incurred only superficial damage; it was then shipped to McDonnell for refitting. 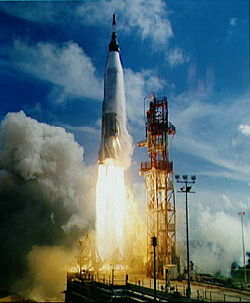 April 27: Explorer XI Launch by a Juno II from LC26B. 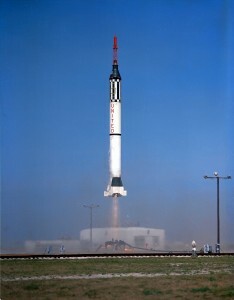 April 28: Launch of Little Joe 5B (suborbital test under maximum dynamic pressure conditions of the LES). The launch vehicle to pitch into a lower trajectory than had been planned, with a result that the abort maneuver experienced greater dynamic pressures than had been specified in the flight test plan, thus exceeding the objectives. 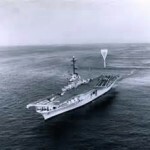 May 4: Two-man flight launched from the aircraft carrier USS Midway of the Navy balloon Stratolab V to 113,740 ft altitude in a successful test of the Navy Mark IV full pressure suit by Com. Malcolm Ross and Lt. Com.Victor Prather. Unfortunately, Lt. Com. Prather drowned during the water recovery. 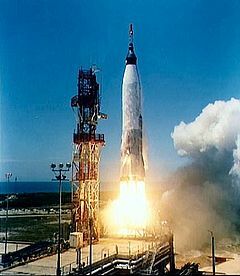 May 5: Launch of Mercury-Redstone 3 with Alan Shepard in Freedom 7 on a suborbital flight (first U.S. manned space flight). The Redstone booster performed well during the boost phase, although there were some vibrations, and cutoff was well within specified limits. 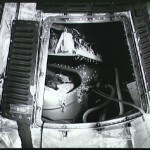 After separation, Shepard exercised manual control of the spacecraft in the fly-by-wire and manual proportional modes. 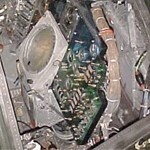 The attitude control system operated well, with few thruster fuel leaks. Reentry and landing were accomplished without any difficulty. During the flight, the spacecraft attained a maximum speed of 5,180 miles per hour, rose to an altitude of 116.5 statute miles, and landed 302 statute miles downrange from Cape Canaveral. The pilot experienced a maximum of 6 g’s during the booster acceleration phase and slightly less than 12 g’s upon reentry. 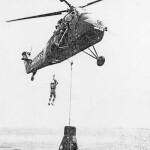 The duration of the flight was 15 minutes and 22 seconds, with weightlessness existing for approximately 5 minutes. 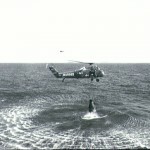 Recovery operations were perfect, as helicopters were able visually to follow the descent of the spacecraft. 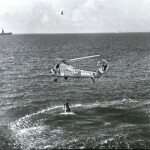 Contact was made with the pilot two minutes after impact and recovery was initiated. 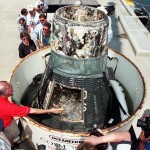 There was no damage to the spacecraft, and Shepard was in excellent condition. 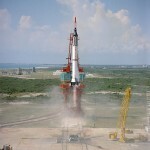 The public was not told that the mission was to be flown by Shepard until May 2 (at the first launch attempt). 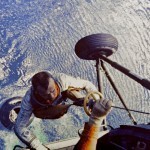 This was the only mission where an astronaut wore a personal parachute as a bail-out option at low altitude – a last minute decision. (see photo below). 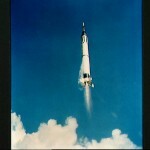 May 15: Completion of Apollo spacecraft feasibility studies by GE/General Dynamics/Martin. May 24: Failed attempt to launch a Juno II/Explore (S-45A) from LC 26B. 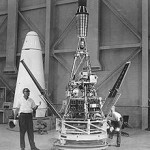 May 29: Between this date and September 15, 1959, a centrifuge training program was conducted at the Aviation Medical Acceleration Laboratory directed entirely toward training the astronauts for the Mercury-Atlas orbital missions. 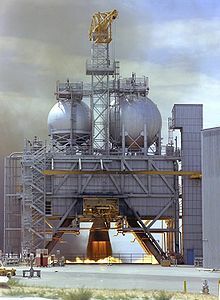 June 6: The Saturn C-1 S-1 stage was test fired at Marshall Space Flight Center with all eight H-1 engines successfully firing for the full run. June 8: Failed attempt to launch Discoverer 24 from Vandenburg AFB by a Thor Agena B.
June 16: Discoverer 25 launch from Vandenburg AFB by a Thor Agena B.
June 29: Transit 4A launch by a Thor Able from LC17A. July 7: Discoverer 26 launch from Vandenburg AFB by a Thor Agena B.
July 12: Tiros III launch by a Thor Delta from LC17A. 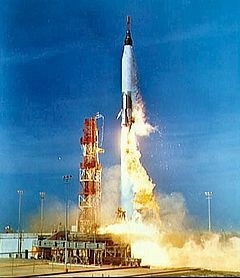 July 12: Midas 3 launch from Vandenburg AFB by a Atlas Agena B.
July 21: Failed attempt to launch Discoverer 27 from Vandenburg AFB by a Thor Agena B.
July 21: Launch of Mercury-Redstone 4 with Gus Grissom in Liberty Bell 7 on a suborbital flight. 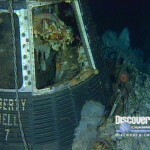 Spacecraft was lost during recovery and was later salvaged in 1999. From lift-off to reentry, operational sequences were similar to those of the first manned suborbital flight. In the ballistic trajectory, the spacecraft reached a peak altitude of 118 statute miles and landed 303 statute miles downrange from Cape Canaveral. Grissom’s flight experience was similar to Shepard’s in that there was a 5 minute period of weightlessness, and neither reported any ill effects resulting from this condition. The MR-4 pilot also found it easy to control his spacecraft attitude in the manual mode of operation. 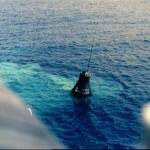 The spacecraft was lost during the recovery operations, when the explosive side egress hatch activated prematurely while Grissom was awaiting helicopter pickup. 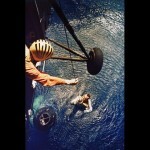 The astronaut egressed immediately and was retrieved after swimming in the water 3 or 4 minutes. 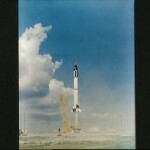 With this second successful suborbital flight, the Space Task Group felt there was nothing further to be gained from this phase of Project Mercury, and the remaining Redstone launch vehicle flights were canceled. 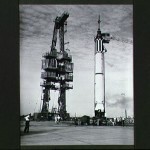 July: Titan II selected as Gemini launch vehicle. August 4: Failed attempt to launch Discoverer 28 from Vandenburg AFB by a Thor Agena B.
August 6: Launch of Vostok 2 on a modified R-7 booster from Baikonur with Gherman Titov on a 17 orbit, 25 hour flight. He experienced severe space motion sickness, the first person to describe this. 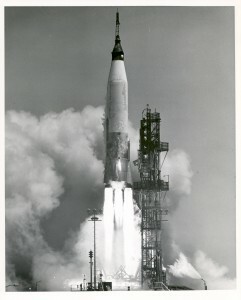 August 16: Explorer 12 launch by a Thor Delta from LC17A. 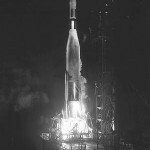 August 23: Ranger 1 was launched by an Atlas Agena B from LC 12. After being placed in a parking orbit, the Agena B failed to restart to send the spacecraft on a lunar trajectory. 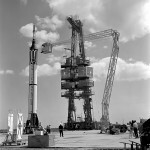 August 23: The Large Launch Vehicle Planning Group (Golovin Committee) notified the Marshall Space Flight Center (MSFC), Langley Research Center, and the Jet Propulsion Laboratory (JPL) that the Group was planning to undertake a comparative evaluation of three types of rendezvous operations and direct flight for manned lunar landing. Rendezvous methods were earth orbit, lunar orbit, and lunar surface. MSFC was requested to study earth orbit rendezvous, Langley to study lunar orbit rendezvous, and JPL to study lunar surface rendezvous. The NASA Office of Launch Vehicle Programs would provide similar information on direct ascent. 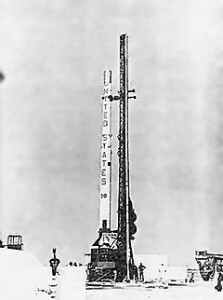 August 25: Explorer 13 launch from Wallops Island by a Scout rocket. August 30: Discoverer 29 launch from Vandenburg AFB by a Thor Agena B.
September 9: Failed launch attempt of Samos III from Vandenburg AFB by a Atlas Agena B.
September 12: Discoverer 30 launch from Vandenburg AFB by a Thor Agena B.
spacecraft to attain an earth orbit. The orbital apogee was 123 nautical miles and the perigee was 86 nautical miles. 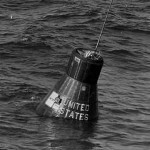 After one orbit, the spacecraft’s orbital timing device triggered the retrograde rockets, and the spacecraft splashed in the Atlantic Ocean 161 miles east of Bermuda. 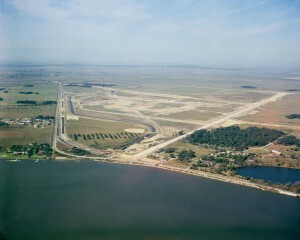 September 17: Discoverer 31 launch from Vandenburg AFB by a Thor Agena B.
September 19: It was announced that the Mission Control Center would be built at the Manned Space Center in Houston. Construction started in April 1962, it opened in September 1963, and the first mission controlled from there was Gemini Titan IV in June 1965. 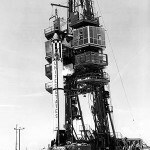 October 13: Discoverer 32 launch from Vandenburg AFB by a Thor Agena B.
cost-plus-fixed-fee contract with McDonnell Aircraft Corporation for the Mark II Mercury spacecraft. 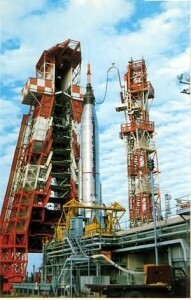 This would later become the Gemini program. Twelve flights were planned beginning with an unmanned qualification flight in May 1963. 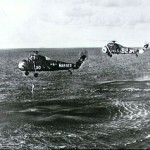 Succeeding flights would occur at two-month intervals, ending in March 1965. Flight No. 2 would be a manned 18-orbit mission with the twin objectives of testing and of further qualifying the spacecraft for longer missions. The next two flights (Nos. 3 and 4) would be long-duration tests to demonstrate the crews’ ability to function in space for up to 14 days. 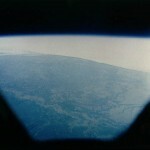 Remaining flights were to establish orbital rendezvous techniques and to demonstrate the capability to rendezvous and dock in space. The proposal was made to develop the design concept of a paraglider landing system. October 21: Midas 4 launch from Vandenburg AFB by an Atlas Agena B.
October 23: Failed attempt to launch Discoverer 33 from Vandenburg AFB by a Thor Agena B.
October 27: First suborbital launch of the Saturn 1 (SA-1) from LC 34. October 27: Failed Kosmos launch attempt. 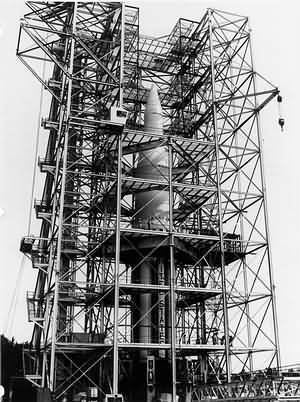 November 1: Unsuccessful launch attempt of Mercury Scout-1 from LC 18B to test the Mercury Tracking Network. November 5: Discoverer 34 launch from Vandenburg AFB by a Thor Agena B.
November 10: Atlas E launch with a squirrel monkey, Goliath, which exploded 35 secs into the flight. November 15: Discoverer 35 launch from Vandenburg AFB by a Thor Agena B.
November 15: Transit 4B launch from LC17B by a Thor Able. 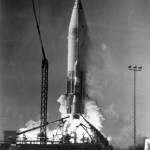 November 18: Ranger 2 was launched by an Atlas Agena B from LC12. 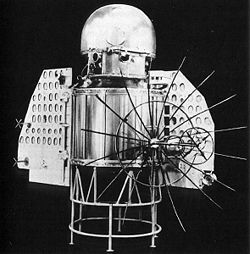 After being placed in a parking orbit, the Agena B failed to restart to send the spacecraft on a lunar trajectory. 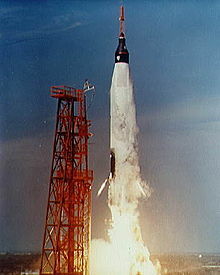 November 22: Failed launch attempt of Samos 4 (Vandenburg AFB) by an Atlas Agena B.
November 29: Successful two orbit flight of Mercury Atlas-5 with Enos, 37.5 pound chimpanzee, launched from LC14. Scheduled for three orbits, the spacecraft was returned to earth after two orbits due to the failure of a roll reaction jet and to the overheating of an inverter in the electrical system. Both of these difficulties could have been corrected had an astronaut been aboard. 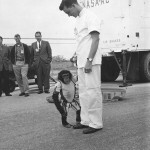 During the flight, the chimpanzee performed psychomotor duties and upon recovery was found to be in excellent physical condition. He was found to have frequent PVC’s on his in-flight electrocardiogram which was later determined to be due to a Swan-Ganz catheter that had malpositioned itself into the right ventricle. Enos died of Shigella dysentery 11/4/62. December 7: Plans for the development of a 2-man Mercury spacecraft were announced by Robert R. Gilruth, the Director of the Manned Spacecraft Center. On January 3, 1962, this program was initially designated Mercury Mark II and later, Project Gemini. December 11: Failed Kosmos launch attempt. 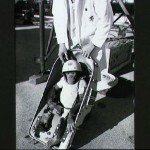 December 12: Discoverer 36 launch from Vandenburg AFB by a Thor Agena B.
December 20: Suborbital flight of a rhesus monkey, Scatback, who was lost at sea after recovery. December 21: Failed Kosmos launch attempt. 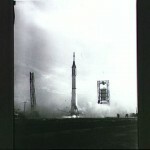 December 22: Successful launch of Samos 5 (Vandenburg AFB on an Atlas Agena B). 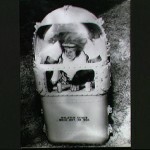 Welch, B E, Morgan, T E, Ulvedal, F, Henderson, W W. Observations on the SAM two-man space cabin simulator I. Logistics aspects. JAM 1961 32:583-590. 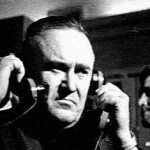 Morgan, T E, Ulvedal, F, Welch, B E. Observations on the SAM two-man space cabin simulator II. Biomedical aspects. JAM 1961 32:591-602. McKenzie, R E, Hartman, B O, Welch, B E. Observations in the SAM two-man space cabin simulator III. System operator performance factors. 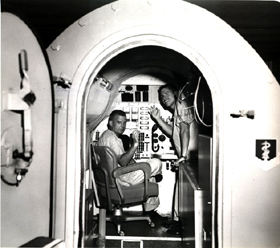 Flinn, D E, Monroe, J T, Cramer, E H, Hagen, D H. Observations in the SAM two-man space cabin simulator IV. Behavioral factors in selection and performance. Graybiel, A, Clark, B. Symptoms resulting from prolonged immersion in water. Graveline, D E, Balke, B, McKenzie, R E, Hartman, B O. Psychobiologic effects of water-immersion-induced hypodynamics. JAM 1961 32:387-400. 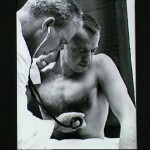 >Bartlett, R G. Pulmonary function evaluation in space flight. Clark, B, Graybiel, A. Human performance during adaptation to stress in the Pensacola slow rotation room. JAM 1961 32:93-106. Beckman, E L, Coburn, K R, Chambers, R M, DeForest, R E, Augerson, W S, Benson, V G. Physiologic changes observed in human subjects during zero G simulation by immersion in water up to neck level. JAM 1961 32:1031-1041. 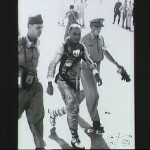 Burns, N M, Burdick, R L. Effects of pressure-suit inflation on reaction times of Project Mercury astronauts. JAM 1961 32:849-852. Konikoff, J J. 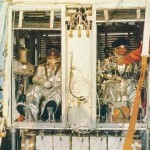 Oxygen recovery systems for manned space flights. King, B. Physiological effects of postural disorientation by tilting during weightlessness. Ruff, G E. Psychological effects of space flight. JAM 1961 32:639-642. Schaefer, H J. Current problems in astroradiobiology. I. 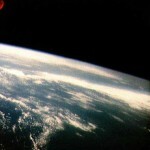 Solar Influences on the Radiation Field in Space. II. On the Shielding of Cosmic Rays. III. Role of the time factor in the dosimetry of ionizing radiation in space. IV. Biological Effects of Accelerated Heavy Ions. VII. Review of Biological Effects of Galactic Cosmic Radiation. Strughold, H, Ritter, OL. Orbital characteristics of earth and moon satellites as a basis for space medical studies. JAM 1961 32:422-424. Reynolds, S R M. Sensory deprivation, weightlessness and anti-gravity mechanisms. Schock, G J D. Study of animal reflexes during exposure to subgravity and weightlessness. JAM 1961 32:336-340. Whiteside, T C D. Hand-eye coordination in weightlessness. Rohles FH, Grunzke ME. A Model for Behavioral Research with Mice in Biosatellites. Eddowes EE. Survey of Leisure Time Activity: Implications for the Design of a Space Vehicle. JAM 1961 32:541-544. Grieder HR, Barton JR. Criteria for Design of the Mercury Environmental Control System, Method of Operation and Results of Manned System Operation. Lamb LE, Roman J. The Head-Down Tilt and Adaptability for Aerospace Flight. Bates JH. 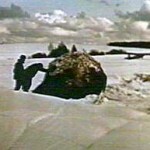 Recent Aspects in the Developments in a Closed Ecologic System. V. Heavy Ion and Millibeam Irradiations on Mammalian Tissue. Graveline DE, Barnard GW. Physiologic Effects of a Hypodynamic Environment: Short-Term Studies JAM 1961 32:726-736. Galler SR. Relevance of Biological Orientation Research to the Field of Bio-Astronautics. JAM 1961 32:535-540. Hendler E, SantaMaria LJ. Response of Subjects to Some Conditions of a Simulated Orbital Flight Pattern. JAM 1961 32:126-133. Brown JL. Orientation to the Vertical During Water Immersion.